The Edenic Sin was Deliberate Disobedience - The call to obedience was clearly sounded in Eden. Adam and Eve knew the will of God but disobeyed it. Sin Separates Us from God - Estrangement between Creator and "the created" is deadly, for it thrusts upon life a discordant note which negatively affects every relationship that a mortal has in the distance between birth and the grave. Estrangement Issues in Disharmony with God - The rebellion in Eden triggered a moral mechanism in the hearts of both Adam and Eve. Plagued by a sense of guilt and fearful of facing the offended, Adam and Eve took the one avenue of escape left open to them. They hid from God. Estrangement Issues in Disharmony with Self - Without God, life degenerates into a purposeless trek to nowhere. Blind to things of the spirit, they will scratch around in the wastelands looking for meaning here and purpose there; but every avenue will lead them to dry wells. Estrangement Issues in Disharmony with Others - Inner hurts projected outward instead of upward, place every good and beautiful human relationship in jeopardy. He or she not at peace with self will find great difficulty in being at peace with others. Estrangement Issues in Disharmony with Nature - Because you have eaten of the tree . . . , cursed is the ground because of you . . . for out of it you were taken; you are dust, and to dust you shall return. Estrangement Issues in the Misuse of Creation - The curse was a declaration of what would be because God's children had had the choice of a rose or a thorn and had chosen the thorn. Now they must live with it. Disobedience, Revolt, and Separation Issue in Guilt and a Sense of Guilt - Guilt is ascribe to a person by God when they have violated His sovereign will. A Sense of Guilt is what a person feels when they have violated God's will or what they think to be His will. Guilt is removed by Christ. A Sense of Guilt is removed by faith in Christ. God Does Not Abandon Sinful Humanity. A New Promise is Given - A seed out of woman (Jesus) would rise up and crush the head of evil. Broken note - The "intent of God" that the inhabitants of the world should dwell in a domain where they would have harmony with all things is mutilated and maligned. Figure facing away from outstretched hand - The Edenic account portrays that dilemma as the direct aftereffect of disobedience with God. 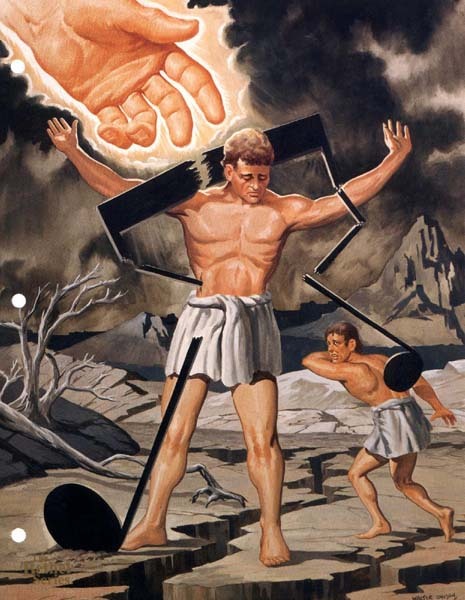 Outstretched arms of central figure - Discontent and unsatisfied with "the limited freedom" (Gen. 2:16-17) demanded by God, humanity (Gen. 5:1-2) revolts against God. Space between central figure and outstretched hand - Disobedience and revolt issues in separation and estrangement from God. Painfull countenance on central figure's face - Estrangement issues in disharmony with God. Broken note penetrating flesh - Estrangement issues in disharmony with self. Broken note striking second figure - Estrangement issues in disharmony with others. Broken note penetrating earth - Estrangement issues in disharmony with nature. Cracked earth and parched ground - Estrangement issues in the misuse of creation. Yokelike appearance of broken note - Disobedience, revolt, separation, and estrangement leaves God's created ones carrying the burden of guilt and a "sense of guilt." Large hand extended in beckoning position - God does not abandon sinful people. A new promise is given.